Politics Is Operation Olive Branch's goal to invade Syrian lands? 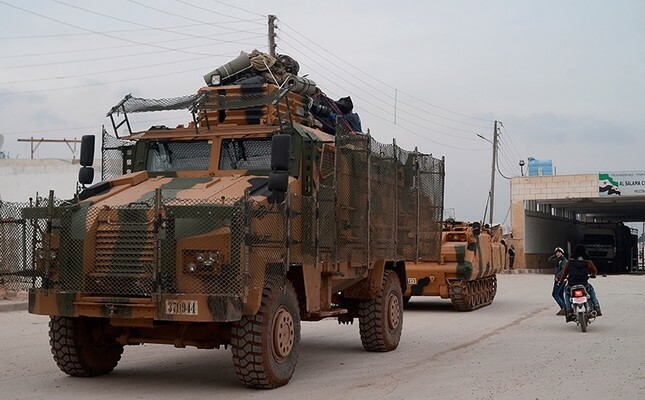 The Turkish Armed Forces (TSK) opened a new front of the Operation Olive Branch from northern Syria's Azaz district, east of Afrin, Anadolu Agency (AA) said Monday. According to AA, numerous Free Syrian Army (FSA) elements were taking part in the latest move. The Turkey-backed FSA fighters were deployed to Azaz on the eve of Operation Olive Branch. The strategically important Mt. Barsaya in Afrin, Syria, was captured in the first day of the operations, according to Anadolu Agency correspondents in the region. The terrorist organization PYD/PKK had been using the mountain -- which overlooks Syria's Azaz district and the Turkish province of Kilis -- to attack civilians with howitzers and missiles. Separately, the villages of Sheikh Badi, Marso and Haftar were also captured in northern Syria's Bulbul district. With the newest land taken, the number of captured areas totals 15 on day three of Operation Olive Branch, which aims to establish security and stability along Turkish borders and the region as well as to protect the Syrian people from the oppression and cruelty of terrorists, according to the Turkish General Staff. The operation was launched on Saturday, targeting the PKK terror group's Syrian affiliates the Democratic Union Party (PYD) and its armed wing People's Protection Units (YPG) as well as the remaining Daesh elements in Afrin region on Turkish-Syrian border.